Two more weeks have flown by, and today I moved in with my third and final home stay family, the Miyadais. I was very sad to say goodbye to the Fukudas, and especially to Rinta, the 8 year old brother to whom I’ve become unimaginably attached. Goodbye Rinta-kun!! I will miss you dearly! On my last night, the Fukudas gave me a series of small, incredibly thoughtful gifts. The most touching for me was a handmade photo album with a range of pictures recounting the various little adventures and experiences we’ve had together over the past two weeks. Rinta, a phenomenally smart, studious boy with a deep love for kanji, wrote very cute speech bubble commentary to go along with many of the pictures. Although I consider it out of character for me, I must admit that, sitting at the dinner table looking through the photo booklet, tears welled up in my eyes. In a matter of only 14 days, I have really come to think of the Fukudas as family. For my part, I made Rinta-kun two mix-CDs with a variety of music. Rinta loves music. We frequently listened together to the Michael Jackson and classical CDs that they have at home (I think I mentioned before, Rinta has a surprising and very entertaining love for MJ). Now, he’s got some of my favorites to listen to, too! I am really going to miss the whole Fukuda family. As Rinta is an only child, I think I fit really well into the mix as an older brother figure. And as an only child myself, it was so wonderful to have a little bro! So needless to say, it’s tough to move. But, as is the norm here, がんばります！(ganbarimasu, I will do my best!) and hope to make the most of my new home and family. I certainly have no reason to complain. My new family consists of two parents and two children, a boy named Shuugo of Rinta’s age (8 years old) and a girl named Rio who is 11. 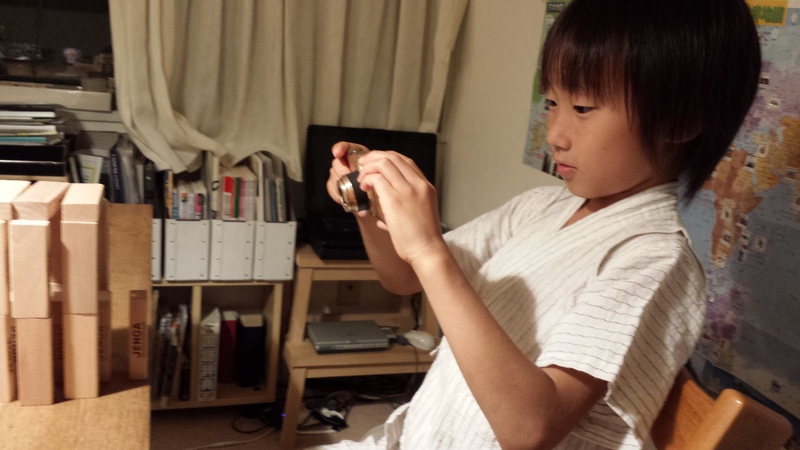 They are both sweet kids, and Shuugo has generously (although perhaps not entirely voluntarily) given up his room to me for the course of my stay. 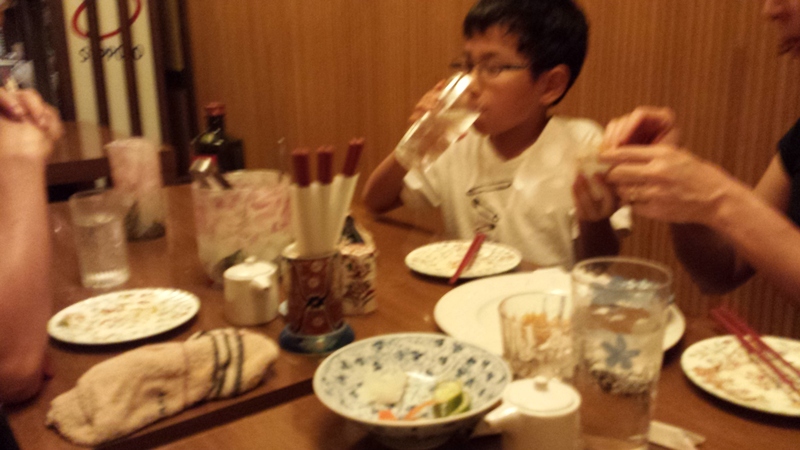 Here is a blurry version of Shuugo, from our first dinner together tonight! The Miyadai parents are both supremely generous, kind-seeming people. I’ve met them both before on two occasions, during which I visited their home for dinner parties with friends/Fukuda-san (Mrs. Miyadai is a professional pianist/piano teacher, and Rinta is one of her students). The Miyadai parents are also my first host parents to speak highly proficient English, which means communication is easier. At the same time, though, it does mean I will have to challenge myself a little more to continue practicing Japanese while I am around them! I don’t want to fall into the habit of speaking English too often. I’m sure the next two weeks have many new and exciting adventures in store. Here at the 1 month mark, I have to keep reminding myself to look around with fresh eyes and appreciate every moment I have here in Japan. It is too easy to stop seeing all the incredible things around me! 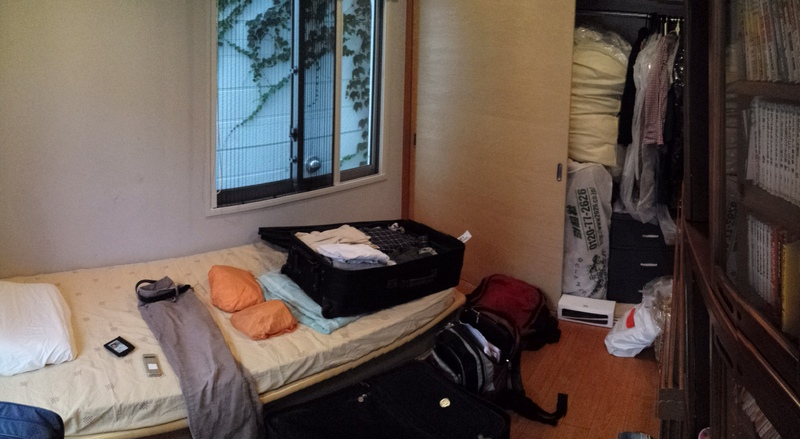 I’ll finish this off with a semi-panorama of my new room. Hope all is well back home with friends and family in the US!